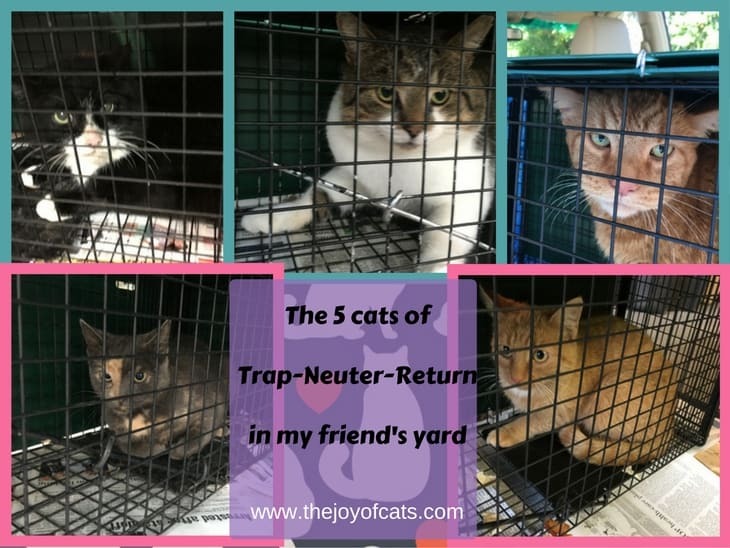 This month five cats went through the Trap-Neuter-Return Process. This post will introduce TNR and tell the story of trapping these five cats. The process of trapping the cats and getting them fixed is called Trap-Neuter-Return. 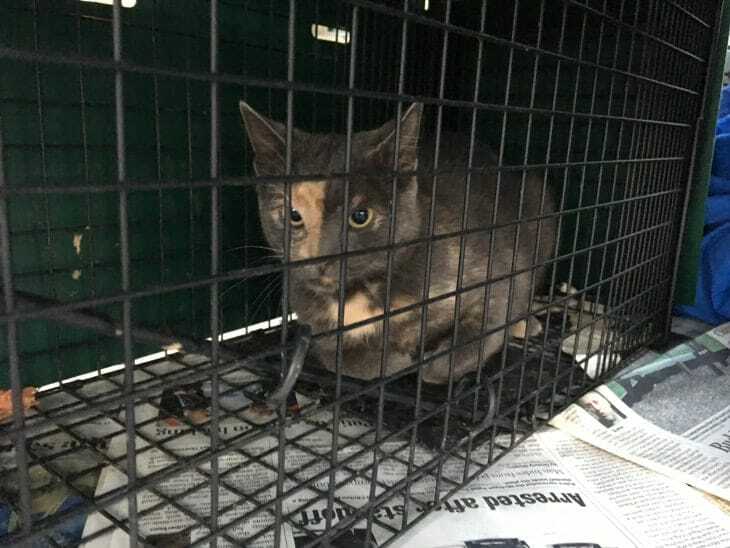 The cats are trapped in a humane trap, spayed or neutered, and then returned to the location they were trapped yet. Relocating is not recommended. Most feral or community cats are not considered adoptable. Neutering the cats prevents unwanted kittens, the cats will also fight and roam less. Since cats can be territorial, the fixed cats will also help keep new cats from coming into the area. The traps are kept covered while the cats are in them to help them stay calm and not try to escape the trap. If they are calm, they are less likely to injure themselves. The traps I used have a backdoor on them (opposite the trap door). The backdoor slides up. This door makes putting food in the trap easier. Also, if needed, Humane Ohio can transfer them to different traps while they recover from surgery. Alley Cat Allies offers extensive information on TNR. In the video below, I talk through the process of returning the cat. Earlier this year, a cat had 5 kittens in my friend Janet's yard. Janet fed the kittens and socialized the them after they were old enough to be taken away from their mom. The mom cat is not friendly to humans. After sharing with Janet about TNR, she decided to try it on October 1. She picked up my two traps. We wrapped up the project on October 20. We were not able to plan for an exact day of when the cats would go into the trap. So, we decided taking the cats to Humane Ohio was the best low-cost option. I agreed to do transport as my full-time job has a later start time than Janet's job. 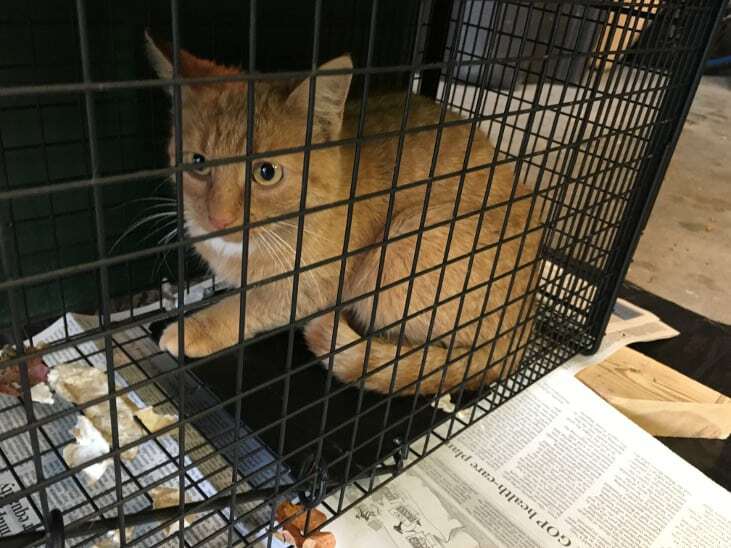 Humane Ohio does not require an appointment for feral cats. They also keep the cats overnight while the anesthesia wears off. The cats also receive an ear-tip and rabies vaccination. 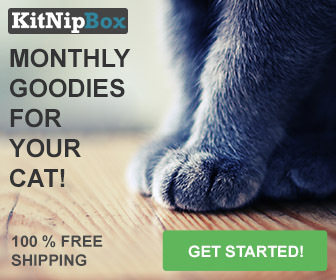 The ear-tip allows for the cat to be identified as fixed, without being trapped again. Janet's goal was to trap the mother of the kittens and another black/white cat they see often. In total, 5 cats were trapped. A male that was already fixed, 2 females, and 2 males. Her neighborhood will hopefully not have any new kittens anytime soon. Humane Ohio requires a name for each cat. The cat names below were made up when the cats were trapped. 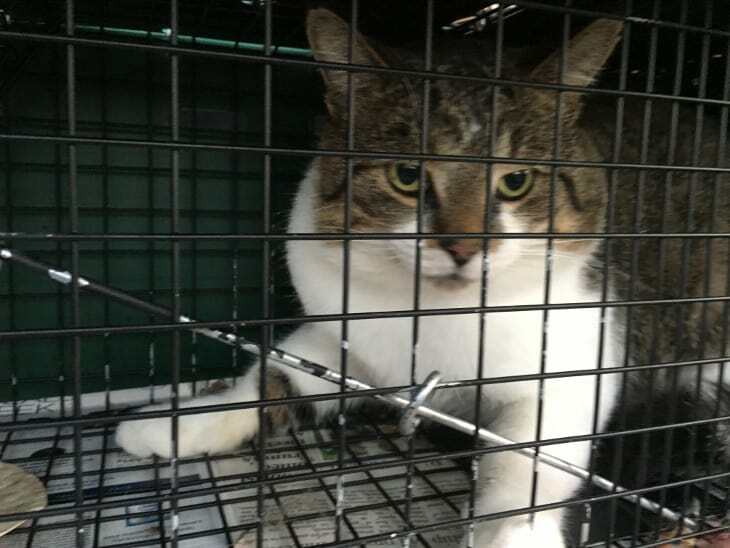 The date is the day the cat was taken to Humane Ohio. Even though we had two traps, the cats were not efficient for as, only trapping one cat at a time. Ginger was the first cat to enter one of the traps. Janet suspected that this might the mother cat. A few hours after dropping him off at Humane Ohio, I received a call that Ginger was a male and already neutered! That was a shock. Fortunately, he was friendly, and Humane Ohio staff was able to examine him without putting him under for surgery. I went back and retrieved him as quickly as possible. We suspect that this was someone's indoor/outdoor cat that wasn't wearing a collar. He also does not have a microchip. If you have an outdoor cat, please put a collar on it. This was quite a stressful day for Ginger which could have been avoided. Callie was the second cat. Due to her calico like coloring (mabye she is a tortoise shell? ), we called her Callie. We also correctly suspected that she was a female. This was not the mother of the kittens that Janet socialized. The Humane Ohio staff noted that she was in heat. If she had not been spayed, the chance of her becoming pregnant again this year was high. Brutus, a tuxedo cat, was the male cat Janet was hoping to trap. He likes to spend time in the neighbor's driveway and in Janet's bushes along the front of her house. Janet thought this cat might be hard of hearing. 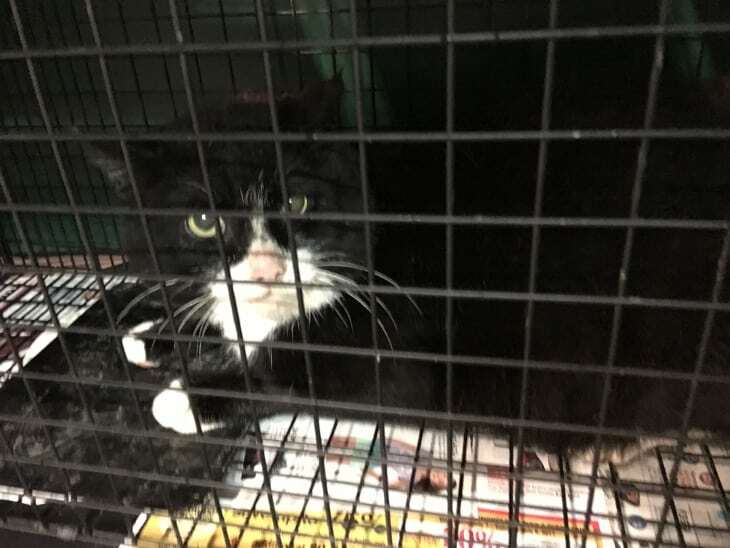 The staff at Humane Ohio checked, and his hearing seemed normal as far as they were able to evaluate while he was in a trap. I suppose he may have selective hearing! His ears were dirty and had ear mites. The staff cleaned his ears and treated him for the mites. Sarah is the mother of the kittens Janet socialized! Orange female cats are uncommon. You can see that she does have a bit of white. She was not happy about the trap. Humane Ohio noted that her front claws were broken possibly due to trying to dig out of the trap (the trap was kept covered). And she had an abrasion on her nose. Janet thought she was the last cat we would trap in her yard. But then, she noticed a new cat on her front steps! That was Cat 5. Bobby is adorable! I named him Bobby has we were not sure if this cat would be male or female. The staff at Humane Ohio suspected male due to his large head which is more typical for an unaltered male than a female. He was a bit timider in the trap than some of the others. The staff also noted he was missing some teeth and dental tartar. I noticed when released him that he had a sore on his neck and was missing some fur on his back. The staff didn't mention this and I had not noticed prior to drop off. Given that trapping him again is very unlikely, I didn't follow up about it. The video below, shows Bobby coming out of the trap in my friend's backyard. Above, are the five cats trapped in my friend's yard during October. 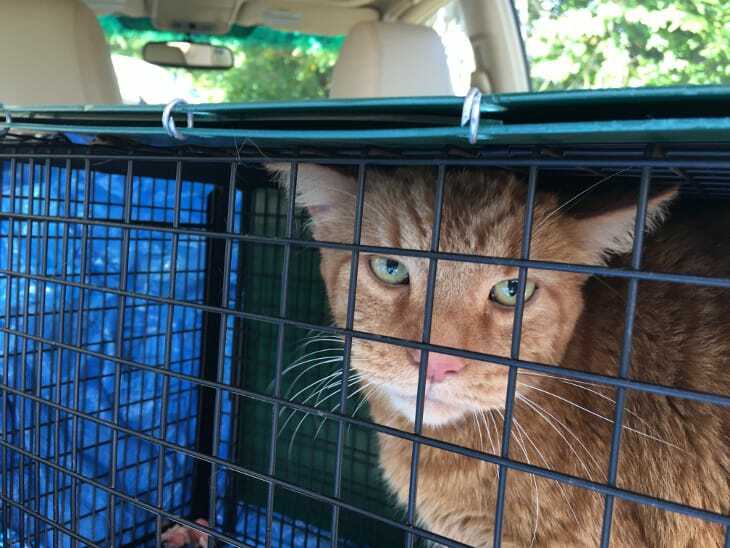 The cats went through the Trap-Neuter-Return (TNR) process with cat 1 skipping the neuter since he turned out to already be neutered. The cats had surgery at Humane Ohio and were returned to my friend's yard the following day. Alley Cat Allies provides TNR information and resources. I've read many of their articles to learn how to do TNR. TNR takes time, but it's worth the effort to reduce the number of kittens being born in backyards.